No. 75, Jalan SME 3, Kawasan Perindustrian SME, Bandar Indahpura, 81000 Kulai, Johor, Malaysia. Nova Trinity Sdn. Bhd. 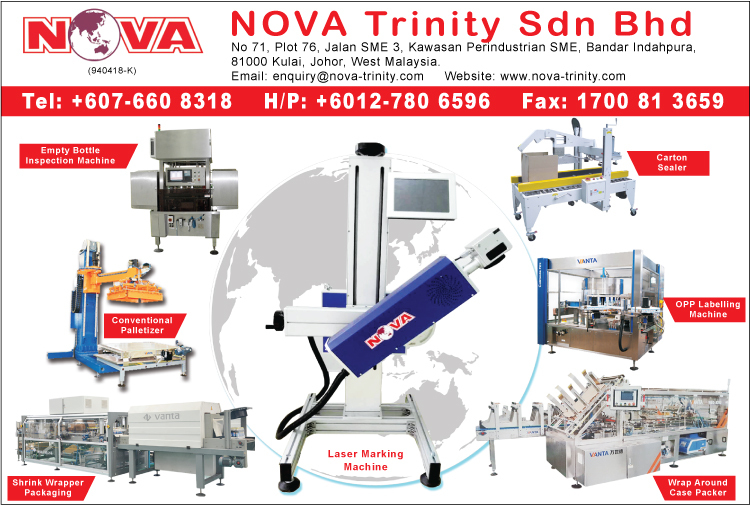 is a professional provider of packaging machineries with advance technology & high accuracy in Malaysia. Leveraging on our rich industry experiences, we have emerged as the noteworthy manufacturer and supplier of packaging and processing machinery for food industries from snack food to frozen food, beverage, powder and liquid turnkey, pharmaceutical, non-food and chemical industries.. The offered products are customized in accordance to the industry needs. All products are developed in adherence to the quality standards by using quality materials & advance techniques. Over the years, the company has built a steady client base of Malaysia, Singapore, Australia, Myanmar and China.